Although I wrote everything I know about squirrel issues for this website, oftentimes a problem with squirrels in the attic is beyond the scope of the do-it-yourself homeowner to solve. I have found a professional company in Greenville, South Carolina that handles problems with wildlife. Terminix Service, Inc. has access to tools, techniques, and experience that help them do a far better job at wildlife removal than a non-experienced homeowner could. They possess licensing that allows them to do certain types of work legally, that non-licensed homeowners in the state of South Carolina are not allowed to do. For the welfare of your situation, and the squirrels, in some cases it's best to hire a pro. There are good companies and bad companies out there. I've done research on such companies, to get to know them, and feel confident recommending their services. I therefore recommend a company called Terminix Service, Inc. which services Greenville, South Carolina. If you have a squirrel problem, or any other conflict with a wild animal, and live in Greenville, I am confident that this company, Terminix Service, Inc., is the one to call. I asked the company to describe their service range, and they said this - We service the counties of Union (Union, Jonesville, Lockhart, Carlisle, Monarch), Chester (Chester, Eureka Mill, Fort Lawn, Gayle Mill, Great Falls, Lowrys, Richburg, ), Laurens (Clinton, Cross Hill, Gray Court, Joanna, Laurens, Mountville, Princeton, Waterloo, Watts Mills), Cherokee(Gaffney, East Gaffney, Blacksburg), York (York, Tega Cay, Smyrna, Sharon, Rock Hill, Riverview, Newport, McConnells, Lesslie, Lake Wylie, India Hook, Hickory Grove, Fort Mill, Clover) and Newberry (Newberry, Whitmire, Little Mountain, Peak, Pomaria, Prosperity, Silverstreet). Terminix Service, Inc. operates 24/7, so don't hesitate to call at any time to discuss your wildlife problem, and schedule an appointment for same-day or next-day service. I'm really sorry for that bad service. What part of Tennessee do you live in? I will find out what's going on there. I live in Putnam county. Today the district manager called me and kind of made it right. He asked me to email him links to the live traps, and he said they would install the live trap that I ordered. It won't be here till Friday, and I have to leave for a few months on Saturday, but I am going to leave it on the porch and hopefully they will install it correctly and catch the remaining squirrels that way. Today the technician came out with a humane trap supplied by the copany. It turned out that they did have some after all. He mounted it to one end of the house and closed off the remaining two entry points. I suggested that he leave one entry point open so that the squirrels that are in the habit of coming in, would come in and then maybe exit through the one way door trap. But he said this wasn't the right way. So how do you handle this? Do you leave one entry point open for the squirrels to get in, so they can get out via the one way door trap? In this case the house has wood siding, and the squirrels have chewed holes in it. Well, if the squirrel is out, it's out. If you leave a hole open, they may just go in and out of that hole, not the trap. If you're worried about chewing on the wood siding, some live cage traps will catch the squirrels. Or you could spray/paint super hot sauce on the wood. Ok. So the one way door traps are for when you know the squirrels are in the house? I guess you have to mount them at a time when you think all or most of the squirrels are inside, like in the evening. I am going to get some live cage traps tomorrow. Maybe I should paint super hot sauce on too. I also have Ropel. Do you think that would work? If you have a squirrel problem in Greenville County South Carolina, or any other conflict with a wild animal, I am confident that we can solve it. 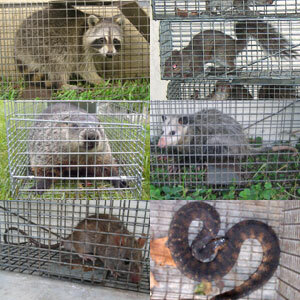 We use humane methods when dealing with Greenville wildlife removal situations. Squirrel Control Greenville. Our company is fully licensed and insured in South Carolina. Call us any time at 864-642-0295 for a price quote and to schedule a same-day or next-day appointment to solve your squirrel problem in Greenville.